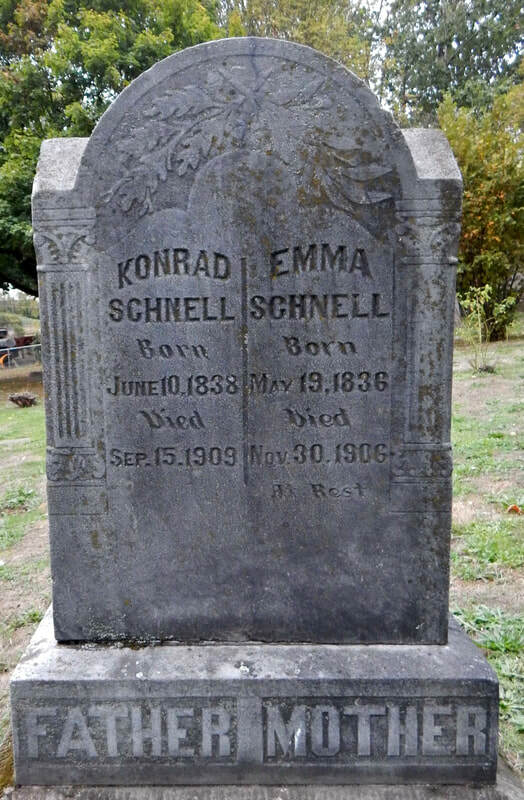 Johann Konrad Schnell was born on June 9, 1838 in Norka, Russia, the son of Ludwig Schnell (born 1812) and Katharina Jörg (born 1813). Konrad (Conrad) first married Katharina Magdalena Huck (born 1838) in Norka on January 29, 1857. After giving birth to six children, Katharina Magdalena died on April 17, 1868. One of those children, Johannes (born December 9, 1860), would immigrate to the United States and also settled in Portland. On November 23, 1869, Conrad married Anna Maria Müller who was born in Norka on May 13, 1836, the daughter of Ludwig Müller (born 1798) and Anna Maria Heuser (born 1800). Anna Maria was the widow of Johannes Lehl. Conrad and Anna Maria (Emma) became the parents of three children who were born in Norka: Peter (born October 18, 1870), Johann Heinrich (Henry) was born June 21, 1873, and Magdalena (born December 8, 1875). The Schnell's immigrated to the United States with several other families from Norka departing from Hamburg, Germany on July 4, 1877 aboard the steamship Suevia. In 1880, the family is farming in Clay County, Nebraska along with Conrad's brother, Johannes (John) who was born on August 8, 1853 in Norka. By 1888, the Conrad Schnell family were living together in Albina on the north side of San Rafael two lots east of Rodney Avenue. Both Conrad and his son John were working as laborers. In 1891, Conrad and Emma are living on the south-side of Russell, two lots east of Margaretta Avenue (now MLK. Blvd.). Sons Peter and Henry are living at the same address. All three of the adult men are working as laborers. One of Conrad's sons, Peter, married Anna Maria (Emma) Miller, the daughter of John and Anna Elisabeth Miller on February 19, 1891. The ceremony was performed by Rev. Hartung of the nearby German Methodist Church since no Volga German churches had yet been established in Albina. The Schnell's hosted the Miller family when they first arrived in Portland. Peter and Emma started a grocery store at the corner of Union Avenue and Fremont Street and lived in back of the store. Emma's family also lived at the store until their home was completed in May 1891. Later, John O. Miller and his son-in-law Peter ran the store. The profits were too small for two families and Peter bought another store across the street which he kept for three years. Emma died on November 30, 1906. Konrad died on September 15, 1909. Both are buried at the Historic Columbian Cemetery in Portland. Photograph courtesy of Steve Schreiber. Haynes, Emma S. My Mother's People. N.p. : 1959. Print. Last updated August 5, 2017.